This RB Skyline plug-in ECU will save you time and money as it will plug straight into the vehicle’s original wiring loom without the need for messy adaptor harnesses. It replaces the original circuit board inside the factory ECU enclosure and mounts using the factory brackets. It is suitable for most twin-cam RB engines using a manual transmission as detailed below. Automatics are not supported. This plug in will also work on other twin cam RB powered cars that have the same large blue plug as the Skylines. This includes the A31 Cefiro and C33 Laurel. 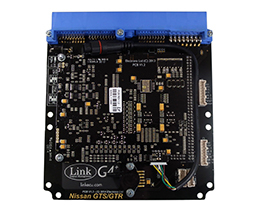 It will not work on an R34 GT-T. We have another G4+ plug-in ECU for this model. 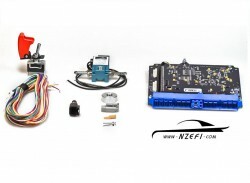 MAP sensor – This ECU comes with an on-board 4.0Bar (up to 44psi boost) MAP sensor. If higher boost pressures are required then an external MAP sensor may be used and connected to one of the analog inputs of the G4+’s expansion connector using the XS Loom (sold separately). 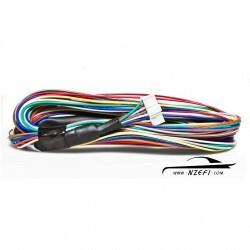 Alternative options exist for modifying the factory loom to use existing wiring for an external 12v MAP sensor (contact NZEFI for details on this).The airflow meter is not required. 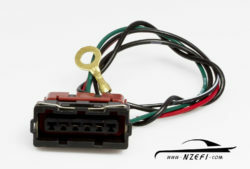 Boost control – The factory boost solenoid wiring on R33 RB25DET’s may be used, however an appropriate boost solenoid (sold separately) must be used. This solenoid may be fitted to other models where electronic boost control wasn’t originally used by making a minor modification to the wiring loom (contact NZEFI for details). Injectors – The Link G4+ plug in is NOT designed to be used with low impedance injectors. The R32 RB20 and R33 RB25 engines are factory fitted with high impedance injectors so no change is required. However if aftermarket low impedance injectors have been fitted then the correct ballast resistors MUST be fitted. These are available separately. R32-34 RB26DETT GTR engines all have low impedance injectors from factory, but they already have ballast resistors. If the GTR injectors are replaced with high impedance injectors then the factory ballast resistor pack must be removed. The R32-33 GTS / GTS-T Skyline plug-in ECU is available as either a ‘Basic’ or a ‘Turbocharged’ engine package. These packages differ slightly from our conventional plug-in Turbocharged ECU packages in that the expansion loom contains only the wiring that is required for installing the package, and no wiring that isn’t required.